MOZART: Piano Concerto No. 21 in C Major, K. 467 "Elvira Madigan"
HD Recording · DDD · Total Length: 26 Min. 42 Sec. by Wolfgang Amadeus Mozart, performed by Christoph Soldan & Silesian Philharmonic Orchestra. Conductor: Pawel Przytocki. he Piano Concerto No. 21 in C major, K. 467, was completed on 9 March 1785 by Wolfgang Amadeus Mozart, four weeks after the completion of the previous D minor concerto, K. 466. I. Allegro maestoso - In common time. The tempo marking is in Mozart's catalog of his own works, but not in the autograph manuscript. II. Andante in F major - In both the autograph score and in his personal catalog, Mozart notated the meter as alla breve. The opening movement begins quietly with a march figure, but quickly moves to a more lyrical melody interspersed with a fanfare in the winds. The music grows abruptly in volume, with the violins taking up the principal melody over the march theme, which is now played by the brass. This uplifting theme transitions to a brief, quieter interlude distinguished by a sighing motif in the brass. The march returns, eventually transitioning to the entrance of the soloist. The soloist plays a brief Eingang (a type of abbreviated cadenza) before resolving to a trill on the dominant G while the strings play the march in C major. The piano then introduces new material in C major and begins transitioning to the dominant key of G major. Immediately after an orchestral cadence finally announces the arrival of the dominant, the music abruptly shifts to G minor in a passage that is reminiscent of the main theme of the Symphony No. 40 in that key. A series of rising and falling chromatic scales then transition the music to the true second theme of the piece, an ebullient G major theme, which can also be heard in Mozart's Third Horn Concerto. The usual development and recapitulation follow. There is a cadenza at the end of the movement, although Mozart's original has been lost. The famous Andante, in the subdominant key of F major, is in three parts. The opening section is for orchestra only and features muted strings. The first violins play with a dreamlike melody over an accompaniment consisting of second violins and violas playing repeated-note triplets and the cellos and bass playing pizzicato arpeggios. All of the main melodic material of the movement is contained in this orchestral introduction, in either F major or F minor. The second section introduces the solo piano and starts off in F major. It is not a literal repeat, though, as after the first few phrases, new material is interjected which ventures off into different keys. When familiar material returns, the music is now in the dominant keys of C minor and C major. Then it modulates to G minor, then B-flat major, then F minor, which transitions to the third section of the movement. The third section begins with the dreamlike melody again, but this time in the relative key of F major's parallel key, A-flat major. Over the course of this final section, the music makes its way back to the tonic keys of F minor and then F major and a short coda concludes the movement. The final rondo movement begins with the full orchestra espousing a joyous "jumping" theme. After a short cadenza, the piano joins in and further elaborates. A "call and response" style is apparent, with the piano and ensemble exchanging parts fluidly. The soloist gets scale and arpeggio figurations that enhance the themes, as well as a short cadenza that leads right back to the main theme. The main theme appears one final time, leading to an upward rush of scales that ends on a triumphant note. The opening of the second movement in Mozart's handwriting. The second movement was featured in the 1967 Swedish film "Elvira Madigan". As a result, the piece has become widely known as the "Elvira Madigan concerto". Neil Diamond's 1972 song "Song Sung Blue" was based on a theme from the andante movement of the concerto. An excerpt from the second movement was also featured in the James Bond film The Spy Who Loved Me, as Atlantis rises from the sea. An electronic arrangement of the concerto's first movement was used as the main theme of the TV series Whiz Kids. The second movement is also used in "Annie's Love Song" and "Music Monsters" from the children's program, Little Einsteins. The Second Movement was also used in the episode "Sleepy Time" of the children's show SpongeBob SquarePants while the titular character explores his pet snail Gary's dream. he German press describes the pianist Christoph Soldan as an artist personality who works with the spiritual intensity and soulful dimension of a piece of music, rather than giving a purely technical virtuoso performance. This challenge to music and to himself is rarely seen today. Soldan studied under Professors Eliza Hansen and Christoph Eschenbach at the Hamburg Musikhochschule. His break-through to active international concert playing came in a tour with Leonard Bernstein in summer 1989. Of Christoph Soldan, the world- famous director said, "I am impressed by the soulful size of this young musician." Since then, Soldan has played in numerous tours with renowned orchestras across Europe and abroad. A particularly close co-operation binds him to the polish conductor Pawel Przytocki. A tour of piano evenings took place in Mexico and other countries in Central America in October 1997. In August 1998 he debuted in Salzburg and in the Chamber Music Hall of the Berlin Philharmonic, and in May 1999 in the Leipzig Gewandhaus. In March 2000, there were three piano evenings in Japan. So far, there have been radio and television productions with the Hessische Rundfunk, Frankfurt, Deutschlandfunk, SWR, ORF and ZDF. The Bayerische Rundfunk broadcasted his piano evening in the Munich Residenz in October 1998 and his concert in the Bad Brückenau music festival live in 1999. Radio Bremen braodcasted his recital in Bremen in august 2002. In spring 2001 Christoph Soldan participated the Prague Spring Festival accompanied by the slovakian chamberorchestra "Cappella Istropolitana". 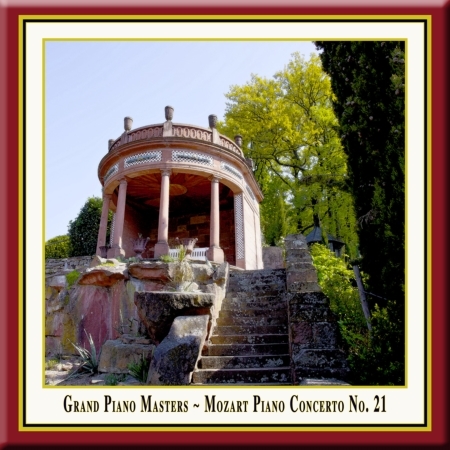 Two recitals in Hamburg and Berlin were followed by a live - recording of two Mozart piano concertos in the medieval monastery of Maulbronn in september 2002. In the 2003/2004 season, Christoph Soldan will be guesting with various programmes in Germany, Austria, Switzerland, Slovakia, France and the USA. In January 2004 a concert-tour to South Africa will follow. Christoph Soldan combines a long-standing cooperation with the Polish conductor Pawel Przytocki. Przytocki works since 1999 as a constant guest conductor of the radio symphony orchestra Krakau and perfomed with the Budapest Concert Orchestra, the Orchestra Sinfonica de Xalapa in Mexico, the Real Philharmonia de Galicia in Spain, the Cappella Istropolitana and the Schlesische Kammerphilharmonie Kattowitz. The Schlesische Kammerphilharmonie Kattowitz (Silesian Philharmonic Orchestra) was founded in Poland 1945. This chamber-orchestra, which constists of the soloist from the philharmonic orchestra, excists in this form since 1981. The newspapers characterizes this orchestra as "highly accurate, dulcet and full of juvenile spirit". Accordingly the orchestra performed and performs with celebrated artists like Zubin Mehta, Arthur Rubinstein and Krystian Zimerman. This artistical capacity co-operates perfectly with Soldan´s interpretations and the conductor´s concept of Mozart´s works. The result is an new remarkable documentation of an unique and high-contrasted reception of piano-works from the famous maestro, Wolfgang Amadeus Mozart. The concert grand piano is incontestably the king of instruments. We could now wax lyrical about its incomparable dynamics and go into its ability to go from the tenderest of sounds in a soft minor key to the magnificent power of a fortissimo, or I could rhapsodise about its impressive size and elegance. But what makes this instrument really fascinating is its individuality, since each one is unique in itself - created by a master. A concert grand has a life all of its own that a virtuoso can really "get into" and hence bring the work of the composer to life. In our Grand Piano Masters Series, we get into the character and soul of the concert grand piano and experience, during the performance itself, the dialogue between the instrument, the virtuoso and the performance space. Just soooo wonderful. Thankx a lot!! !